Microsoft Windows Small Business Server SBS 2008 20 User CAL Add On 6UA-00104. Windows Small Business Server 2008 is an all-in-one server solution designed to help you keep your data more secure and your company more productive. Discover how Windows Small Business Server 2008 is designed and priced especially for small businesses, so you can improve productivity and help protect your vital business information. Windows Small Business Server 2008 is designed for small businesses. It is designed to work with existing technology, build on Microsoft best practices, and deliver a comprehensive network at an affordable price. Share resources and equipment, such as Internet access, printers, and fax machines, to get the most value from your technology investments. As your business needs change, Windows Small Business Server 2008 can change with you--easily add users, servers, and applications, or expand into other Microsoft technologies. Work more efficiently and add more value to your business with an integrated administrative console. Work confidently with a top performing network based on Windows Server 2008 technologies. Windows Small Business Server 2008 helps protect your vital business information from loss, by backing up the data on your network and helping enable you to recover accidentally deleted files. Use antivirus and anti-spam protection to help protect your information from malicious attacks, viruses, and spam. Keep your computers and servers current and your network healthy and up to date with the latest updates. Get better control over your business and business information with daily and weekly reports alerting you on the health and security of your technology. A single administrative console gives you or your IT consultant a daily view of PCs and servers and makes it easier to manage common IT tasks. Get an at-a-glance snapshot of the security and health of your PCs and servers from a'green check' report. Improve your day-to-day efficiency by using a central repository for storing and sharing information. Connect with customers, vendors, and suppliers easily and professionally, with access to contacts, appointments, and files from any Internet-connected computer or a Windows Mobile-powered smartphone, so you can be responsive even when you are away from the office. Create a bigger business presence with online marketing tools from Microsoft Office Live Services Small Business, so you can differentiate your business and present a more professional image to your customers. Windows Small Business Server 2008 is available in two editions: standard and premium. Windows Small Business Server 2008 Premium Edition becomes a second server solution. Windows Small Business Server 2008 Standard Edition will run on one hardware server, and Windows Small Business Server 2008 Premium Edition will run on two hardware servers, with the second server running Windows Server and SQL Server for line-of-business applications. 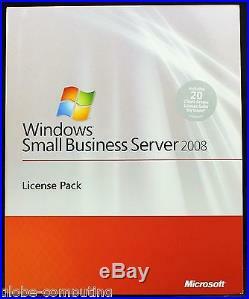 Windows Small Business Server 2008 Standard Edition includes. Microsoft Windows Server 2008 Standard Technologies. Microsoft Windows SharePoint Services 3.0. Microsoft Windows Server Update Services 3.0. Microsoft Windows Live OneCare for Server. Integration with Office Live Small Business. Windows Small Business Server 2008 Premium Edition includes everything from Small Business Server 2008 Standard plus. Microsoft Windows Server 2008 Standard Edition. Microsoft SQL Server 2008 Standard for Small Business. Top Ten Reasons To Use Windows Small Business Server 2008. Windows Small Business Server 2008 (SBS 2008) is an integrated server solution that helps you protect your business data, increase productivity, and present a more professional image to customers. Get a comprehensive, all-in-one solution - Windows Small Business Server 2008 takes the guesswork out of selecting software for your network. It brings together the Microsoft product technologies that businesses need most into a single solution. These technologies are integrated into one product, making it easy for you or your IT consultant to install and manage. Stay connected to your customers, vendors, and suppliers - With access to contacts, appointments, and files from any Internet-connected PC or mobile device, you can be responsive to customers, vendors, and suppliers even when you're not in the office. Access the facts you need, in real time. Respond to customer inquiries more quickly and accurately. Protect your business and prevent data loss - Windows Small Business Server 2008 helps protect your vital business information from loss by backing up the data on your network, and enabling you to recover accidentally deleted files. SBS 2008 also enables you to recover data on your network in the event of disaster. With easy-to-use interfaces, you or your IT consultant gain better control of your data, PCs, and network. Access business information and resources from virtually anywhere at any time - Be productive whether you're out of the office, at home, or on the road. Increase your business capacity - Streamline business processes and improve day-to-day efficiency with Windows Small Business Server 2008. It helps automate daily processes by providing a central repository for storing and sharing information more easily--and helps simplify communications with familiar Microsoft technologies. Stay safe with antispam and antivirus protection - Windows Small Business Server 2008 offers antispam and antivirus technologies to help protect your business information and your intellectual property from malicious attacks, viruses, and spam. Keep your network healthy and up-to-date - Windows Small Business Server 2008 provides you with the latest updates to minimize downtime and help ensure network health by keeping your PCs and servers current. Easy-to-read "green check" reports give you a quick view of Microsoft software updates, PC and server status, antivirus status, and backup progress. Take advantage of powerful technologies designed and priced for small business - Windows Small Business Server 2008 includes multiple technologies optimized specifically for small businesses--at an affordable price. It enables you to share resources and equipment, such as Internet access, printers, and fax machines, so you get the most value from your technology investment. Get the flexibility and scalability you need - As your business needs change, Windows Small Business Server 2008 enables you to grow. You can easily add users, servers, and applications. It supports your critical line-ofbusiness applications and is designed to integrate with your existing Microsoft technology. Create a bigger presence in the market - Differentiate your business and present a more professional image to prospects and customers. Windows Small Business Server 2008 Standard Edition. Super-VGA (800 x 600) or higher-resolution monitor. DVD-ROM drive; mouse & keyboard. For a list of specific supported hardware, see the Windows Server Catalog. By design, for supported hardware, Windows Small Business Server 2008 uses the Windows Server Catalog. All server hardware should meet the requirements established for the Windows Server 2008 Logo Program for Systems. You can learn more about these requirements by visiting. 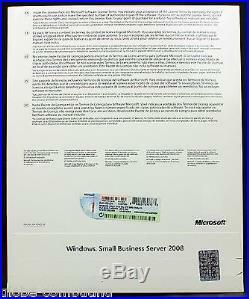 Brand New and sealed Microsoft Windows Small Business Server 2008 Standard Edition 20 User CAL Pack. This is a retail licence pack which is new and sealed as pictured for adding 20 user to your SBS 2008 Standard enviroment Part: 6UA-00104 Origin: Ireland This is not softare it is a license pack only. We offer the latest brand new software products along with some old classic and extreme niche business software products which may be near impossible to find elsewhere at competitive prices often below trade and on top of all that we also offer excellent customer service with an ever expanding knowledge of our product range so as to help our customer make an informed decision even if that means suggesting products that we cannot ourselves supply, we do whats best for our clients. Items paid for before 3pm GMT Mon-Fri will usually be dispatched the same day. Damage to all items should be reported within 14 days of receipt. The software is still sealed and has not been tampered with and does not have a visible product key. The item is in exactly the same condition it was sent in and all contents intact. The item sent was significantly different than as described or proven to be fault. Courier damage, photo's will be required. OEM licensed software where the product key can be seen on the outer packaging. The item "Microsoft Windows Small Business Server SBS 2008 20 User CAL Add On 6UA-00104" is in sale since Thursday, February 28, 2013. This item is in the category "Computers/Tablets & Networking\Software\Operating Systems". The seller is "globe-computing" and is located in kent. This item can be shipped worldwide.